Spain ranks as number 4 globally in terms of installed wind energy but has dropped to 7th place in terms of new projects, according to the Global Wind Energy Council. For many years, Spain has been a paradise for renewable energy producers with generous incentive and government support. But since 2009 the government has slowed down the development of one of the green energies - wind power - with various regulatory measures. 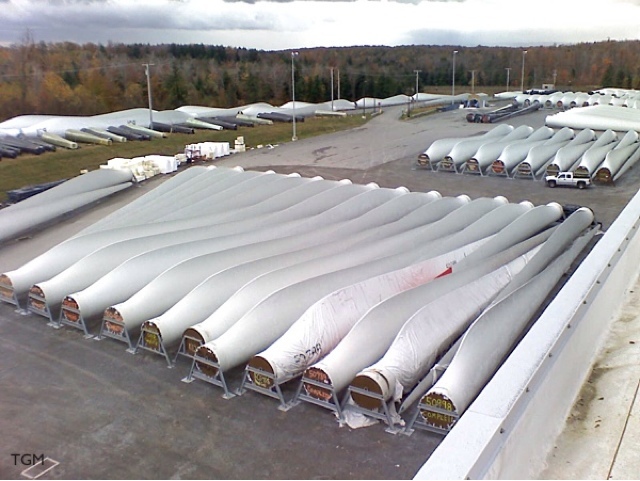 Blades manufactured at Gamesa’s factory (outside of Spain) in Ebensburg, Cambria County. A case in point, Spain's Gamesa, which is among the industry's world leaders, cited "regulatory uncertainty, the persistent economic crisis and financial problems in the sector" as reasons as it laid off 606 of its 4,800 staff in Spain and closed two blade factories in recent months. "Of the 43,000 jobs we had in the wind industry in 2009, there are only 23,000 left" - Sergio de Otto, Fundacion Renovables (Renewables Foundation). When you outgrow the local market, go global! For the likes of Gamesa, and any other green energy producers for that matter, it is not the end of the road. Gamesa markets its products in more than 50 countries, with Mexico, Brazil and Indiabeing key markets. Ten years ago, the company sells 90% of its renewable energy products locally. Today it is the exact opposite - 90% of sales come from abroad. TheGreenMechanics: Putting things into perspective, our national cars have outgrown the local vehicle market, so, it's time we venture globally. But first, we'll need a world class cars to begin with. An 'okay' product with artificially protected home turf is definitely not enough. The size is massive isnt it. A lot of engineering has to be put on them to make them spin.